With the K-bus extension technology, the “Economy plus” Bus Coupler BK4020 allows the connection of up to 255 spatially distributed Bus Terminals to one Bus Coupler. The “Economy plus” coupler supports all Beckhoff system Bus Terminals and can process 512 bit digital inputs and outputs per slave. The number of analog channels is limited by the Interbus protocol to a maximum of 32 input and 32 output channels. The transmission rate is 500 kbaud. Slave devices can be spaced up to 400 m from each other as the fieldbus interface acts as repeater. The overall length of an Interbus ring is limited to 13 km. The identification code and the length code are determined by the Bus Coupler automatically after starting, depending upon the connected Bus Terminal, and are read out by the master. It is not necessary to parameterise the slave. 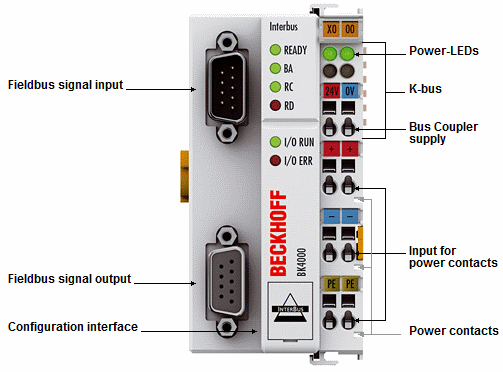 The Bus Coupler recognises the connected terminals and automatically generates the affiliations of the inputs/outputs to the bytes of the process image. The first input/output signal is inserted in the first bit of one word (LSB), beginning from the left. The Bus Coupler inserts further signals in this word. Inputs and outputs are clearly separated. Interbus has been established as an open fieldbus system since 1987. Interbus has a ring structure, and up to 256 stations can be operated in a ring. Data transmission takes place at 500 kbaud. Due to the efficient data transmission, sensor and actuator data can be transferred over great distances. The BK4000 and BK4020 Bus Couplers support the operation of all Bus Terminals. As far as the user is concerned, handling of the analog inputs/outputs is not different to other series. The information is available in the process image of the controller for processing in the form of a byte array. Optionally, the Bus Terminals can also be controlled by the control system. Via function blocks (FBs), the programmable logic controller (PLC) or the Industrial PC (IPC) handles configuration of the complete periphery during the start-up phase. If required, the controller can upload the decentrally created configuration data in order to centrally manage and store this data. Therefore, new adjustments are not necessary in the event of replacement of a Bus Terminal. The controller automatically sets the required setting on power up. This functionality is achievable through the use of the KS2000 software. The Interbus coupler works with the protocol chip SUPI3 and supports the extended diagnostics of the Interbus master. Byte-by-byte addressing in the master is supported as from generation G4. Input current 70 mA + (total K-bus current)/4, 500 mA max. 70 mA + (total K-bus current)/4, 200 mA max. 70 mA + (total K-bus current)/4, 500 mA max. Interbus For further Interbus products please see the system overview.